Le Thi Thu, 42, and her daughter, Nguyen Thi Ly, 11 sit outside their home in a village south of Da Nang, Vietnam. They are second and third generation victims of dioxin exposure, the result of the U.S. military's use of Agent Orange and other herbicides during the Vietnam War more than 40 years ago. 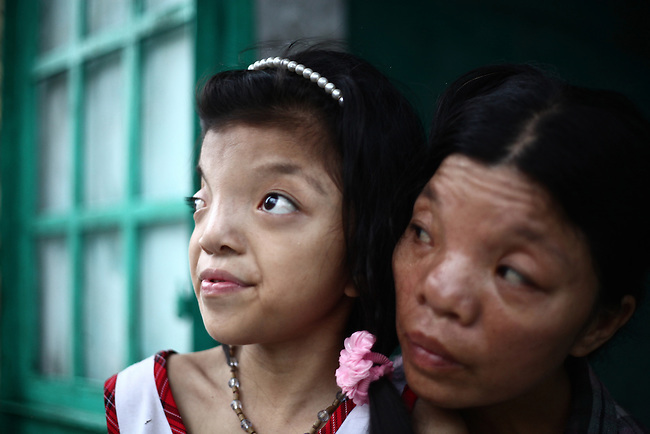 Despite their facial deformities and other health problems, Thu says she never feels anger at what has happened to herself and her daughter. "I'm not angry with anybody just because Vietnam had a war," she says. "A lot of people suffered. Sometimes I feel sad, but I'm not angry with anybody." The Vietnam Red Cross estimates that 3 million Vietnamese suffer from illnesses related to dioxin exposure, including at least 150,000 people born with severe birth defects since the end of the war. The U.S. government is paying to clean up dioxin-contaminated soil at the Da Nang airport, which served as a major U.S. base during the conflict. But the U.S. government still denies that dioxin is to blame for widespread health problems in Vietnam and has never provided any money specifically to help the country's Agent Orange victims. May 28, 2012.